Experts in sensitive skin. No perfume, no colour. Your baby's skin is particularly delicate, which is why Simple Baby has been specially developed to care and protect at a time when babies' skin is at its most sensitive. For gentle and effective cleansing use our Simple Baby Moisturise and Care Wipes to leave your baby's skin feeling smooth, soft and supple. Active benefits. Pro-Vitamin B5 conditions, softens and smoothes. Added Moisturisers nourish and protect. pH balanced works in harmony with your baby's skin. 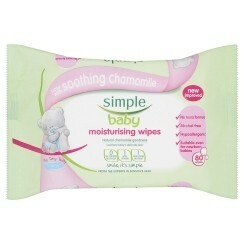 Simple Baby Wipes are truly simple and the packaging is lovely and stands out, i sometimes use the baby wipes to clean my make up like my eye shadow or mascara and it does wipe it off and leave my skin soft, smooth more fresh and relaxed (i don't know if anyone uses it for this purpose). it's very effective and when i use it to clean my nephews bottom or his hands and feet seeing as he has sensitive and delicate skin they feel much more clean, soft and smoother. Overall it does the job and i highly recommend buying this product. When my oldest had bad nappy rash from an allergic reaction to wipes, we tried these in hope we could find something that did not make his skin flare up. They worked so well and actually made his skin better. Great for their faces, hands and accidents.